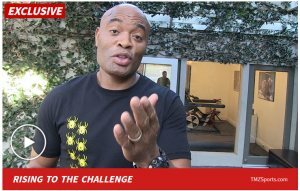 TMZ SPORTS -- Anderson Silva has a message for Conor McGregor -- FORGET A REMATCH WITH KHABIB and fight ME instead! Remember, before UFC 229 earlier this month ... Conor told reporters he'd be interested in a superfight with Silva after he got through Khabib Nurmagomedov. Obviously, the loss put a wrench in Conor's plan -- but Silva says he's still down to scrap as soon as Conor is ready to get back in the Octagon. "I just waiting," Silva told us outside his new Spider Kick MMA gym in West Hollywood ... "I accept the challenge for Conor." Silva says it makes perfect sense for Dana White -- "Two big names. Two big legends. And, why not?" If that can't happen, Silva says he'd still love another crack at Nick Diaz -- since their first fight in 2015 was essentially scrapped from the books, because they both tested positive for banned substances. As for Spider's new gym, Silva says he's created a new elite facility to pass along all of his fight knowledge -- and it looks AWESOME!! !